A properly installed vacuum gauge, shown here adjacent to the filter on the outlet side, is easy to read and doesn’t displace the T-handle. Clients and colleagues around the world regularly contact me for assistance with onboard systems problems, troubleshooting, or repairs, and, not surprisingly, many of these involve fuel systems. Recently a client e-mailed me about an engine and generator that would routinely shut down when either was heavily loaded, but otherwise ran well. There were no overt signs of trouble such as leaks or overheating and no apparent electrical problems. When faced with remote troubleshooting, it’s helpful to place yourself in the position of the person at the other end of the keyboard, cellphone, SSB microphone, or Skype headset. In most cases, these folks aren’t trained mechanics and, in spite of many boats being well equipped with a full set of tools and spare parts, few carry a true complement of engine or systems diagnostic instruments. In many cases I ask questions that lead me, and subsequently them, in the right direction using the tools at hand. Top: While this gauge is adequate, one with a drag, recording, or resettable pointer would allow mechanics to ascertain peak vacuum regardless of the engine’s operating condition, and even when it’s off. Bottom: A vacuum gauge with a recording needle. There are a few fuel-system-troubleshooting tools and techniques that you can exploit, directly or remotely, regardless of the skill level of the operator. Chief among these is the humble fuel-filter vacuum gauge. The vacuum gauge is perhaps the single most valuable tool for fuel system analysis. Its value as a troubleshooting aid is disproportionate to its meager cost. The best vacuum gauges typically cost less than some oil filters. Three criteria must be met to effectively utilize a vacuum gauge for fuel system analysis or troubleshooting. First, it must be properly installed. Second, the user must understand how it works and how to read it. Third, the gauge must be monitored. Typically, vacuum gauges are installed at or near the primary fuel filter. 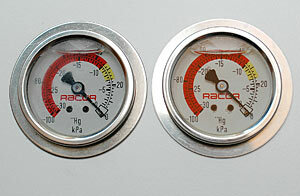 All Racor tandem series filter assemblies include a compound pressure/vacuum gauge. The pressure portion of the gauge is typically not relevant—unless the filter is installed well below tall fuel tanks that feed from the bottom; in that case, it’s possible that the fuel supplying the filters will be under pressure and the gauge may indicate this. While this is not harmful and while Racor turbine series filters can work under as much as 15 psi (0.1 N/mm²) pressure, the manufacturer recommends vacuum or suction applications. 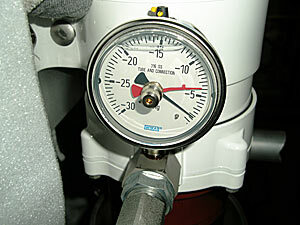 If the primary filter is placed under pressure—either because of its location and the fuel-tank plumbing arrangement, or because a priming or auxiliary fuel pump is placed between the filter and the tank and it’s operated continuously rather than simply for priming—the vacuum gauge may give no indication of filter clogging. The reason is because the vacuum is being offset by the fuel pressure, creating an equilibrium of sorts. This scenario may exist until enough debris accumulates within the filter element, increasing the vacuum and leading to rapid fuel starvation. To avoid that, tell your customers not to pressurize the primary filter, particularly with an electric pump, while under way. For single Racor or other primary filter installations, the vacuum gauge is best installed immediately adjacent to the filter body on the outlet side of the filter. Remember, its primary mission is to measure vacuum between the lift pump on the engine and the filter element. The gauge’s main function is to monitor the condition of the primary fuel filter element. As the element becomes impacted with dirt and debris, the level of effort required for the engine’s fuel lift pump to pull fuel through the filter increases, as does the vacuum imparted on the filter. As is commonly done, installing the vacuum gauge in place of the filter’s T access handle works, and Racor designs the filter for this application. I find this installation less than ideal, because it eliminates the T-handle, making the filter more difficult to service because you need a wrench. Also, the gauge is more susceptible to damage when the filter is serviced. The gauge should be hard-plumbed to the filter’s outlet fittings (such a fitting is available off the shelf for 900 and 1000 series filters; a fitting must be fabricated for 500 series filters), where it can be safely positioned for easy reading. 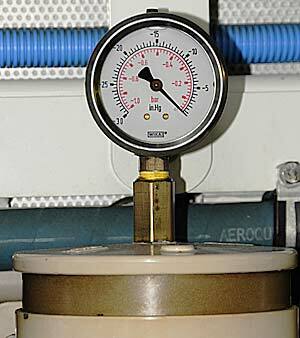 Alternatively, the gauge can be remotely plumbed inside or outside the engineroom for more convenient reading. For vacuum gauge plumbing runs longer than 12′ (3.7m), use hard metallic tubing instead of hose. Gauges equipped with drag or recording needles or resettable pointers are especially useful, because, later, you can view the record of the highest vacuum experienced by the system. Fuel system vacuum is typically greatest when the engine is operating at cruising or full rpm, so checking the vacuum while the engine is idling, or off, will often reveal little about the condition of the filter element. With a drag needle, the operator no longer needs to crawl into the engineroom while the boat is at cruising speed to ascertain fuel vacuum readings. Installing a recording vacuum gauge is one of the most cost-effective upgrades you can offer your customers. 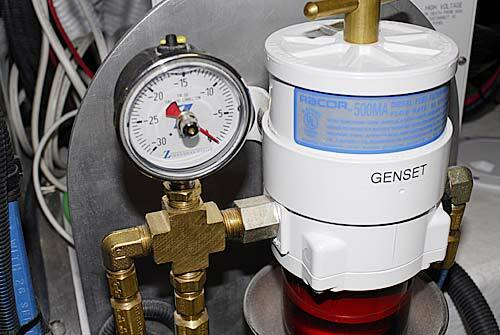 Fuel vacuum gauges can often alert boat owners, operators, or service personnel to clogged fuel filters or other fuel supply issues before they become serious. Or, if trouble does come, a vacuum gauge makes the diagnosis easier. Analyzing and troubleshooting a fuel system with the vacuum gauge may seem intuitive, and for the most part it is. If the vacuum increases, the filter needs to be changed. For the vacuum gauge’s readings to be meaningful, you must first establish a baseline with clean filter elements. If, with clean elements the vacuum is 1″ or 2″ of mercury, this essentially becomes your “zero set point,” and it should be recorded on a tag or label adjacent to the gauge. Anything over that is a result of clogging or a fault. If the zero set point is high, say above 4″ of mercury (most vacuum gauges are calibrated in inches of mercury, anything over about 7″ is considered high, although most engine manufacturers set their own limits), the system has other resistance-to-flow problems that should be addressed. If no notation was made of the vacuum with clean elements with the engine under heavy load, calling on the vacuum gauge to help troubleshoot an operating problem later will be ineffective. If the system always ran at 7″ of mercury (not good), then this reading may lead to chasing faults that don’t exist, or they may exist elsewhere in the system. High vacuum, by the way, can lead to reduced fuel lift pump life as well as cavitation erosion within the injection pump. In the case mentioned at the beginning of this article (the engine and generator that shut down under heavy load), I was able to help the operator identify the problem using the system’s vacuum gauge, but the problem itself was not as straightforward as I had hoped. Initially, based on the high vacuum readings in excess of 15″ of mercury, I suspected that the fuel filter was clogged. The client reported that, indeed, it was clogged, so I was confident I’d helped him solve a problem, albeit a minor one. I received a follow-up message, however, a day later indicating the problem remained, along with the excessively high vacuum. After he conducted a few more tests, by drawing fuel from a different tank and monitoring vacuum changes, I concluded the blockage was either in the tank itself at the fuel pickup, or, worse, inside the manifold. 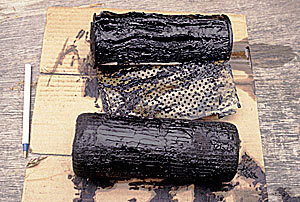 As it turned out, the blockage—a small piece of paper—was periodically being sucked up into the fuel pickup tube inside one of the tanks. Each time that happened, the vacuum readings skyrocketed, causing the engine and/or generator to shut down. When the engine shut down, the vacuum would dissipate and the paper would fall off the pickup tube. The vacuum gauge saved the day by making it clear that the problem was between the fuel lift pump and the tank. With that information this part of the fuel system could be carefully scrutinized. Before the advent of the recording vacuum gauge, remotely mounting units at the helm was not uncommon. Now, with the recording feature, that has become less of a necessity. On a day-to-day basis, a vacuum gauge will allow your customers to change filters only when necessary, rather than based on a perceived need or, worse, not until their engine begins to run erratically. When more-challenging fuel system problems arise, the vacuum gauge serves as a built-in troubleshooting tool for them and for you. About the Author: For many years a full-service yard manager, Steve now works with boat builders and owners and others in the industry as “Steve D’Antonio Marine Consulting Inc.” He is the technical editor of Professional BoatBuilder, and awaits publication (by McGraw-Hill/International Marine) of his book on marine systems.